DD5LP – August 13th. 2015 – DL/BE-093 Buchberg. 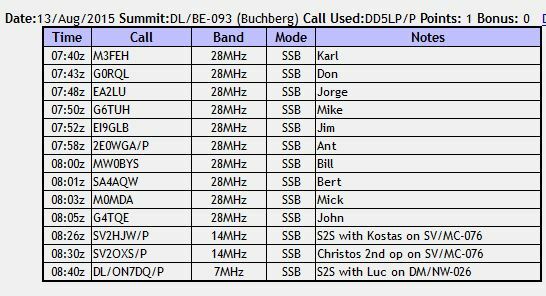 With the 10m/6m challenge coming to an end, my score as an activator (only on 10m as 6m portable operation is not allowed in Germany), was looking a little “sad”, so I decided to activate another summit to get some 10m contacts. I had originally intended activating Zwieselberg above Bad Tölz however after my problems on Breitenberg the previous weekend, with the heat over midday, I didn’t want to repeat the same problems, rather chosing an easier summit where I could carry both bags of equipment to cover all needs. During the previous week, I had been doing some testing using my existing Sotabeams linked dipole, using it set to 30m with some extensions to operate on 10m. Indeed I had tried this configuration out first at a local GMA summit DA/AV-071 Gagl-Berg and later in my garden, to get the extension lengths correct. So my intention was to take this configuration to Buchberg, but also have the Aerial-51 404-UL (OCF) dipole antenna along as a back-up. I had planned on taking a set of end-fed half wave wire antennas along as well, as these are very light and pack up into a very small space, however I got so many different readings from the antenna analyser, I decided to leave them at home, until I can find what’s going on. Buchberg is also located near to Bad Tölz and hence an over 90 minutes drive from my home QTH. The route I knew from the last time I activated the summit in 2014, however this time rather than taking the shortest route suggested by Google (which required me to travel along a road displaying signs saying access only for forestry and farm vehicles), I decided to take the route that I had previously left the site by – via Bad Tölz, past the golf club. While this route is longer, it is a tarmacced (although only wide enough for one car for much of the route) road. The activation went well. I found the location easily and managed to park off the (single track) road to avoid any issues with traffic. When I went across to the field, I say a path went directly across the field to the cross. I had expected to have to walk around the edge of the field as one normally does to avoid damaging any crops, however as there was a well worn track in place I took this to the summit cross. I suspect this track has been created by the mountain bikers that the farmer had complained to the previous activator about. Indeed during my activation a mountain biker, came up to the cross using this track. I suspect someone has created a cycling tour route via the cross. I can understand the farmers displeasure at this. At the moment the field is fallow, however when he wishes to grow a crop in it again, what will happen then? I had no visit from the farmer this year, I had met him last year when I activated the summit. I deliberately started on 10 metres and as I checked my alerted frequency to make sure it wasn’t already in use, back came Karl M3FEH before I had even spotted myself. Karl was a booming signal, conditions on 10m were good. I managed to work 10 stations on 10m, the latter ones with some QSB coming in. Once the contacts on 10 metres ran out, I saw Kostas (SV2HJW/P on SV/MC-076) spotted on 20m, so went there and got a summit-to-summit contact with him and Christos(SV2OXS/P) who was on the same summit. I was just about ready to pack up when I saw that Luc (DL/ON7DQ/P) was up on DM/NW-026 on 40m, so down came the antenna again – in went the links and back up it went for another S2S. One last check on 10m – no more contacts but Jim EI9GLB kindly let me know that my 5w was still getting out well into Ireland, so conditions were still.OK and then I decided to pack up as I had chores to complete at home. This turned out to be a very pleasant and satisfying activation. Nothing rushed, good conditions and all the equipment working as it should. I was especially happy with how well the 30 metre dipole with extensions worked on 10 metres. SotaBeams Linked dipole, 30m secton modified for 3rd harmonic use on 10m. Ramsey QAMP linear amplifier on 20 & 40m. While this was not a lightweight activation, I still need to sort out the EFHW antennas so that I can use them on future activations where there is a lot of walking involved. In all this was a pleasant activation, with a good set of contacts on 10m and no stress. All went to plan.